Health Wisdom from the Stone Age is a five-volume e-book anthology based on The Stone Age Doc, a weekly newspaper column that has appeared in the Reading PA Eagle since 2005. Volumes 1, 2 and 3 are now available at Amazon. We are hard-wired for good health, a strong immune system and long life. Health Wisdom from the Stone Age reveals how we can enjoy these with a genetically appropriate lifestyle. Eat like a Stone-Ager without feeling like one. Do you have a termite lifestyle? You can put the brakes on diabetes. Osteoporosis is not a calcium deficiency disease. Can foods make you look younger? See the whole table of contents for Vol 1. See the whole table of contents for Vol 2. Can germs make you fat? See the whole table of contents for Vol 3. 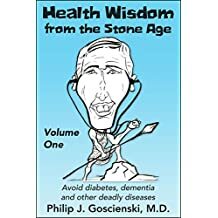 Health Wisdom from the Stone Age is available at Amazon.